Salt Lake City-based Barbacoa Mexican Grill opened its first metro Atlanta location November 23rd in Kennesaw. 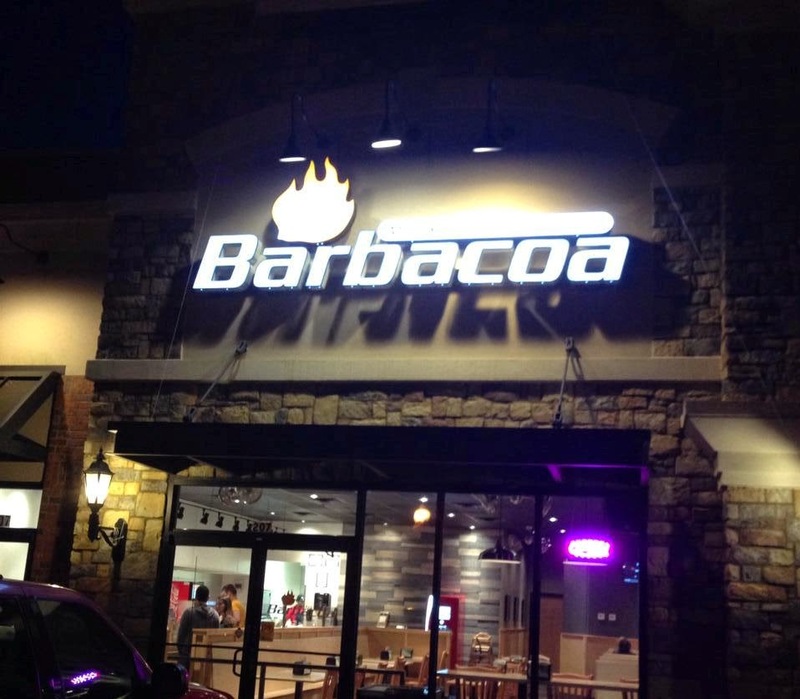 Barbacoa opened off Barrett Parkway at the Shoppes at Ridenour in a former Johnny's Pizza. Little Azio has closed its downtown Atlanta location on International Boulevard (listed as a Peachtree Street address) near Peachtree Center. dELiA*s, the New York-based mall retailer whose main demographic was teen girls, has filed Chapter 11 bankruptcy and plans to liquidate. The retailer started in 1993, and was all the rage throughout the late 90s and early 2000s. As with other mall retailers, changing habits, more options and online shopping have caused declines in popularity and sales. A new Buffalo Wild Wings is planned for Pooler Parkway in Pooler. The new sports bar is being opened alongside the new Tanger Outlets project, not far from Savannah. Mattress Firm has at least temporarily taken over a significant portion of the former Office Depot at Providence Square shopping center on Roswell Road in East Cobb. The Office Depot closed earlier this year as part of the consolidation following the Office Max / Office Depot merger. New Mediterranean fast casual Bezoria (originally known as Bazaria) is slated to open this Monday, December 15th. The new would-be franchise replaces Lime Fresh Mexican Grill, which failed in its entry into the Atlanta market last summer. The space is situated at the corner of Peachtree and 8th Streets beside Villains and Noodle. Framingham, Massachusetts-based Staples plans to close its location at Lenox Marketplace on Peachtree Road in Buckhead December 27th. The Buckhead closure is reportedly the only store closure in Georgia, but is one of 30 the chain announced last month it will close before the end of the year. Following the Office Depot / Office Max merger and with mounting online competition, Staples previously announced plans to close 140 stores, of which these additional 30 were not a part. Aveda Salon will reportedly join previously announced tenants Aladdin's Mediterranean Grill, Earth Fare and La Madeleine: Country French Cafe at Phase Two of Emory Point. Plans call for the project to be complete by early to late spring, with reportedly at least four other smaller spaces still up for grabs. The remaining spaces range from about 1,200 to 2,900 square feet. Piedmont Minor Emergency has closed on Piedmont Road in Buckhead. With the proliferation of WellStreet, now operated in partnership with Piedmont Hospital, and other urgent care facilities, Piedmont Minor Emergency apparently was unable to compete. Meatball Bar & More is now open in the Fashion Cafe at Lenox Square. The new food court eatery offers meatballs, heros, sliders, salads, pizza and even ice cream sandwiches! Bantam + Biddy plans to open its new location at Lenox Square today, starting with breakfast service at 8AM. The new Lenox Square location is situated behind the UGG store and across from where the Delta Airlines ticket office was for many years. Bantam + Biddy has three other locations in town at Ansley Mall and Crescent Avenue in midtown and at Avalon in Alpharetta. When is Office Depot/Max going to have a uniform name for all their locations? Waffle Crisp can be found at Ingles. Staples in Snellville closed this Fall with no mention on their official closure list. Kmart in Snellville is finally shutting its doors as well. Interesting that the closure listings are incomplete lately for many of these big box stores. Qing Mu appears to have opened quietly over the weekend. Yes Quing Mu opened and Doraku opens next week. And the Staples at Prado is available for lease as well so if someone takes it that will close as well. @Anonymous 1:58 AM, pretty sure the OfficeMax name will go away. Not sure how long it will take, the the website already points back to the Depot site. There are three Mattress Firm locations near the intersection of Johnson Ferry Road and Roswell Road in East Cobb. Is there a real need for the three stores? Other note is the Mellow Mushroom in the downtown area of Decatur is now closed and is missed. The closing Kmart in Snellville is becoming an At Home / Garden Ridge like the former Kmart in Buford. Anyone know what is going in at 678 10th Street NW in West Midtown? Please see today's post RE: 678 10th Street. Staples is closing in Hiram, conyers, Sandy springs @ the Prado and in Milton/alpharetta. Contact me if you'd like to backfill or have ideas on users that should backfill each space.